Trump says Russia and Iran would be making a "grave mistake" if they back Syrian attack in province of Idlib. 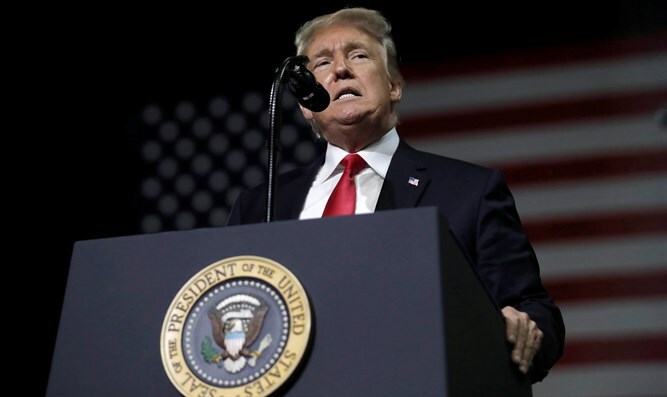 US President Donald Trump on Monday warned Syrian President Bashar Al-Assad against a “reckless” attack in the Syrian province of Idlib. In a tweet, Trump also warned Russia and Iran against taking part in such an attack. “President Bashar al-Assad of Syria must not recklessly attack Idlib Province. The Russians and Iranians would be making a grave humanitarian mistake to take part in this potential human tragedy. Hundreds of thousands of people could be killed. Don’t let that happen!” he wrote. Earlier on Monday, Iran called for rebels to be “cleaned out” of Idlib, as it prepared for talks with Syria and Russia about confronting the last major enclave held by rebels opposed to Assad, according to Reuters. Last week, Iran vowed to continue its military cooperation with the Assad regime, signing a deal with the Syrian government as the two powers gear up for the large-scale campaign in Idlib, which is located in northwestern Syria. Trump did not specify in his tweet whether he would take action if Syria, Russia and Iran attack Idlib. Both the US and Israel have urged Russia to back the demand to have Iran pull its forces from Syria, but have yet to win clear backing from the Kremlin. During his meeting with Trump in Helsinki in July, President Vladimir Putin reportedly expressed support, in principle, for the removal of Iranian forces from Syria.